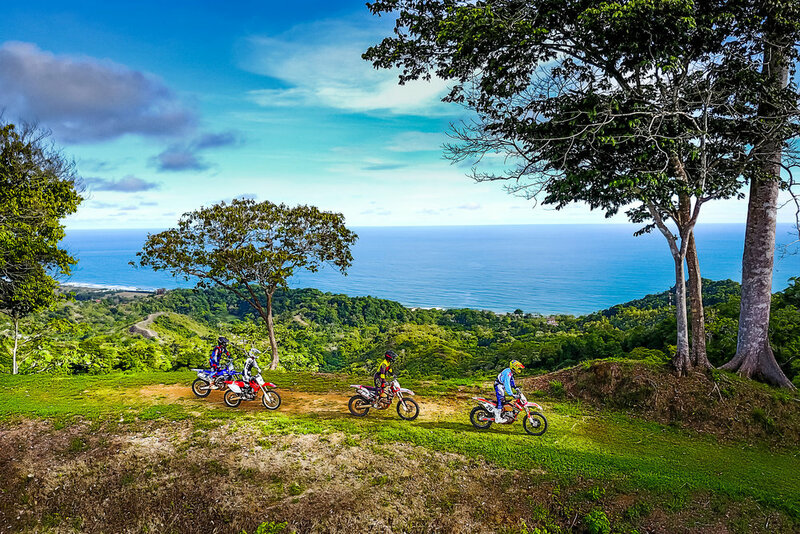 When people from the US motorcycle industry start telling you that they went to Costa Rica to enjoy a few days of riding, it raises some questions: There are a lot of trails here in the US, so why bother to take a plane and go so far away just to ride? Is it just to find a place where you can ride with little or no regulations? Is it just because of the landscape or the exotic name of this Central American country? There’s obviously more than that, and Chris Kilbride knows it better than anybody else. 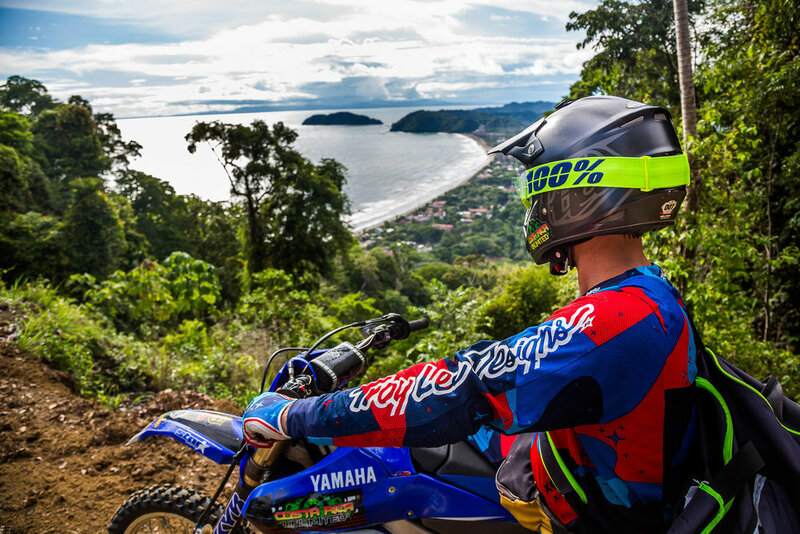 Living in Costa Rica for 15 years now, the California rider was one of the first Americans to ride here. In this country with no army but with a really good educational system, there’s no social tension and the safety is real. Chris loved the place, but not only for the perfect surf break. He built from scratch a dream house on the hills, giving his company, Costa Rica Unlimited, a place to start hosting guests. “Our customers are coming from all around the world,” explains Chris. “Some are saving for years before coming, others can afford ten trips a year. Either way, we treat them all the same” he adds with a big smile! With the rainy season starting in May, there are fewer riders and the plane tickets are less expensive. What if that was the perfect combination to come and try this adventure by yourself? The international flight between LAX and San Jose, Costa Rica is a night flight. Barely awake, the travelers pass through customs and load their rentals cars. For our group, it will be a 4x4 because even though the road between San Jose and Playa Hermosa is a highway, the last mile to reach Costa Rica Unlimited is challenging. The climb was so steep that we needed to shut off the A/C, stay in first gear, and rev the engine in the red zone the whole time! We hadn’t ridden yet, and already we had some sensations. The electric gate opened and we entered a little paradise. Three houses made of stone and wood with an unlimited view of the jungle and the sea, teak floors where we could walk barefoot, terrace with hammocks… we were in a five star accommodation! We could have stayed here for the rest of the day, enjoying the view and listening to exotic birds singing in the sun, but there was no time for a nap. Chris and his associate Carlos have everything ready for the first ride. In the shop, helmets, boots and root protectors are waiting for tourists who would like to enjoy a day of riding during their family vacations in the country. Almost brand new bikes are aligned like in a show room. There are a few 450s, and most of them are 250s, including some very nice KTM 6 days Edition. One push on the start button and the engine awakes, with a pretty decent amount of decibels. It sounds like noise is not a real concern here. “When they hear us, kids are coming out of the houses and ask us to do wheelies,” explains Chris. If it’s for the kids, well then, why not make noise? Right after the gate we entered the trails. It was a large fire road, which brought us on the edge of the hill. It was hard to ride and take in the amazing scenery at the same time! But, we’re all racers at heart and we opened up the throttle. Sliding in corners, the shoulders above the front fender like racers in the Baja 1000, we went crazy fast and soon everyone thought they were an enduro world champion. 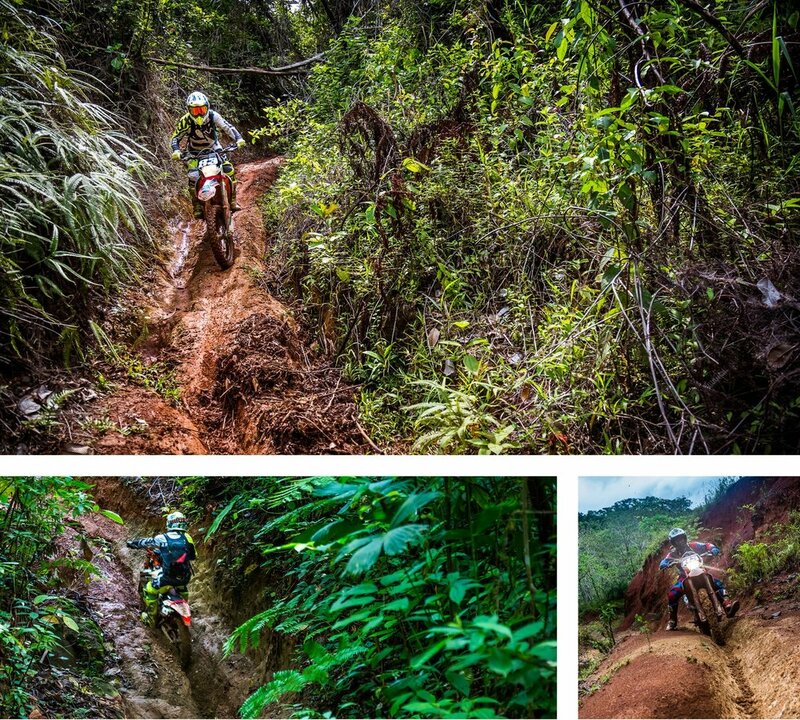 The first downhill was a reality check; steep enough to look like an Olympic skiing hill, the path was full of deep ruts and the dirt was still wet from the night rain. Trying to keep a steady, low speed without touching the brakes was challenging. It was so slippery that the sole idea of grabbing the brake lever seemed enough to make us fall down! Using the engine brake, sweating and feeling our legs and arms burning, we finally reached a small restaurant lost in the middle of the jungle. Magic of this country: fresh fruit juice appeared and all the fear disappeared. The rest of the day would look the same. Discovering the backcountry while keeping the traction, especially in steep climbs where the rear wheel was spinning like it was on ice. After a while, we realized that it was just easier to hit the berm on the side to find traction below the dead wet leaves than to stay in the middle of the trail. Now we rode like motocross guys, full gas and with a big smile under our helmet. Again, the country would make us feel like fools. Indeed, mothers riding antic street bikes, wearing only flip-flops and carrying propane tanks in one hand, were riding the exact same trails. They had no helmet, they had no problem with the slippery dirt, and they smiled at us as if we were innocent toddlers. Riding a $10k bike with nice gears makes you often feel like a king. But here, you just feel humble. The next day, the schedule was different. We headed for the beach, where the tide revealed a flat and endless playground. While some were surfing the shore break, we drew circles on the sand, falling down to try again and again, laughing like kids. We then tried to see how fast we could go, our nose behind the bar, the speedometer showing illegal highway speeds. It was then time for us to go back in the jungle and try to cross the Amazon, or at least a river quite as big. Chris showed us where to cross, and it looked so easy that no one wanted to wait. 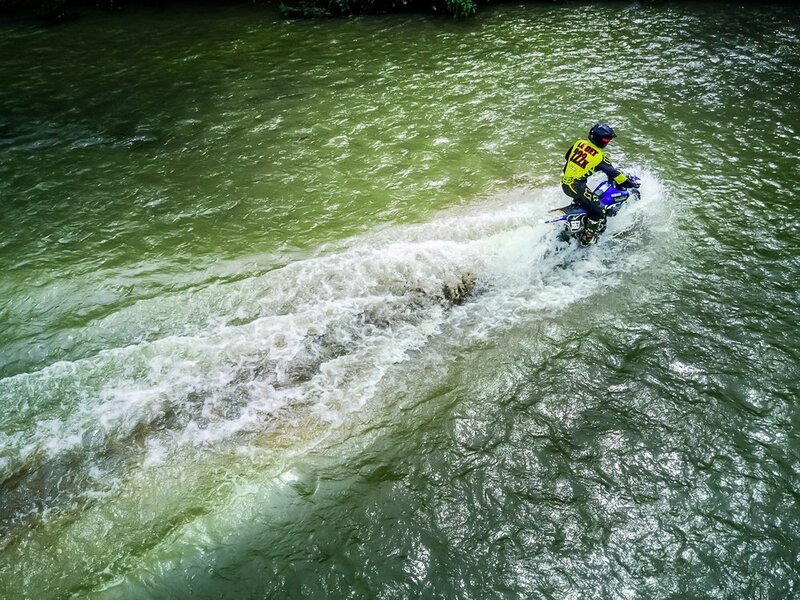 But when we reached the middle of the river, the current was suddenly pushing the bikes away from the safe line. We then needed to be full power, in first gear, just to go against the current and to reach the shore. It was scary, but, of course, everybody did it many times. After eating some fresh fish in a small restaurant, we ended up in front of a waterfall. It was too late to swim, but never too late to splash with friends! The last day, Carlos was our guide for some extreme riding. In the jungle, the sun was nowhere to be found; It was as dark as night. The single track was narrow, slippery as hell, and with all the rocks, vines and ruts, there were enough traps to make us fall down 10 times. Crossing little rivers was easy, except that we needed to thread our way between the trees, descending in dark holes with no visibility, climbing step embankments with no speed at all. Of course, Carlos was aware that it was difficult and always asked if we wanted to split the group. But everybody loved the challenge, and we were just catching our breath when we got back on the fire roads to reach another spot. It is not a riding school here, but you definitely learn how to ride! Going back to the house was like reaching heaven. Polo, the mechanic, cleaned and checked the bikes for us, while Anita cleaned all of our gear before drying them up. We only had to take care of ourselves, which was just so different from riding at home! After the shower, everybody met on the terrace to drink a beer and enjoy the view. The bulbs on the roof gave the ambiance some romantic touch. There was no sound, and we found ourselves smiling, forgetting that our muscles were sore from the long ride. A lot of riders would end up in town to eat in some restaurant or dance in a nightclub, but we enjoyed having a barbecue with Chris and his wife Mièle. And guess what we talked about up to the end of the night? Surf, travels, but mostly bikes and rides. That’s the core of life, right? After a few hours of sleep, it was time to go back to the airport. Only one thing was certain: We would be back! Traveling in Central America might sound challenging but Costa Rica is a really safe place. There is no need for a visa, and the flights are not expensive. 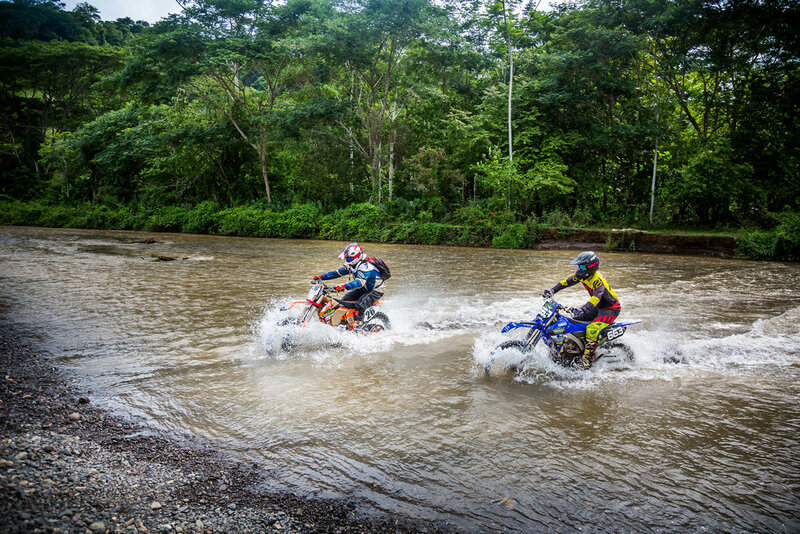 Summertime in the US is the rainy season here, so if you prefer to ride on dry dirt, plan to come in the winter. It might be less fun and more crowded though! Once arriving in San Jose airport, renting a car is easy, but be aware that the speed limits are in km/h and not in mph. You can use Google Maps or Waze on your smartphone for directions, as these two apps can work without using any data. Once you’re in Costa Rica Unlimited, everything is easy. If you’re here with your family and just want to ride one day, it’s possible. The tour starts from the house, in easy or technical trails, but Chris can also put the bikes in a trailer and show you the volcano or bring you to motocross tracks. 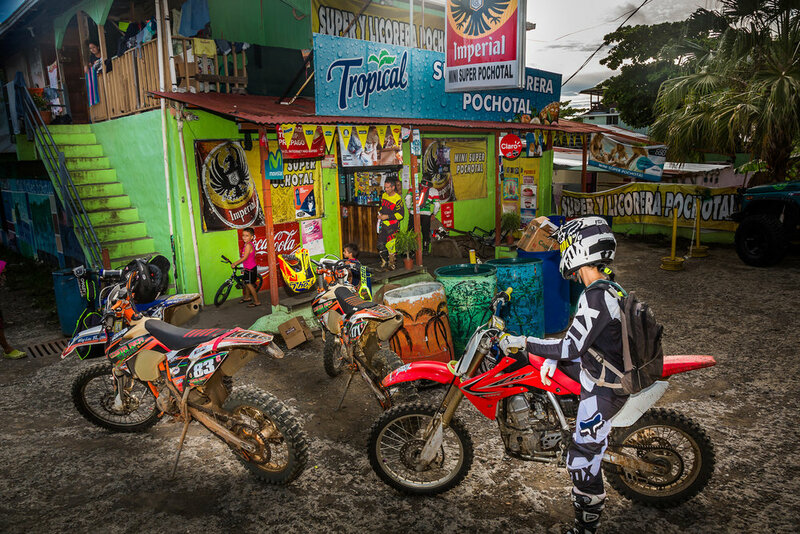 If you want full accommodations, dirt bike renting, bike cleaning, gear cleaning, lunch and guide, it will cost you $1950 for four days, three nights and three full riding days. This price includes a complementary activity like zip line, massage or crocodile sightseeing. Your rental 4x4 lets you visit the nearby cities of Playa Hermosa (3 miles) and San Jose (10 miles). Last but not least, your family can enjoy the beach while you’re riding in the woods. Are you ready to go? You can contact Chris via his website www.costaricaunlimited.com or by phone: 714-368-0656. Special thanks: To Eric Peronnard who convinced us to ride in Costa Rica. Terry Beal, from Push Agency, who helped us set up the trip. Chris, Mièle, Carlos, Sean, Polo and Anita for their kindness. Fabrice and François who agreed to do everything the photographer asked them to do! COMPETITION: HAVE YOU SIGNED UP FOR THE 2018 BAJA RALLY?